If you’ve been searching for a used midsize crossover SUV that can offer you a long list of qualities at an affordable price, you’ve just found the perfect model. A used Hyundai Santa Fe in Orlando, FL gives you the versatility and capability you need every day while also offering you an incredible list of technology features and comfort options to choose from. From top features like navigation and an innovative touchscreen infotainment system to leather upholstery and Hyundai’s Blue Link communications system, you’ll find everything you want in a Hyundai Santa Fe. The Hyundai Santa Fe is a midsize crossover SUV that is available in many different trim levels and offers six- or seven-passenger seating configurations. 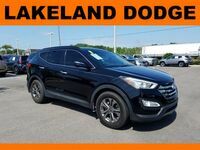 A used Hyundai Santa Fe also offers the increased traction control and performance of an available all-wheel-drive system that helps you maintain control on slick road conditions. The interior of the Hyundai Santa Fe crossover SUV is designed and built to give you the versatility and capability you need. Choose a seating configuration that can seat up to six passengers or go with one that offers to seat up to seven passengers. Either choice will give you the interior comfort you’ve always wanted in a midsize crossover SUV. The Hyundai Santa Fe also gives you an impressive amount of cargo space which comes in handy when you need to haul large items. A Hyundai Santa Fe in Orlando, FL also offers excellent capability thanks to powerful engine options that give you the horsepower and torque you need on the road and to help you tow heavy trailers.